1. 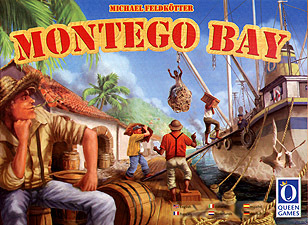 In the hustle and bustle of Montego Bay harbour the dockers are pushing and shoving one another in order to take up the best positions in the warehouses. Each figure can only be moved as far as the cards allow. But these are face down and so turbulent scenes cannot be avoided. 2. Once all the dock workers have settled down the Tally Man waits at the docks. He keeps a tally of what the dockers load on the ships and makes sure that everything is counted fair and square. 3. Once a ship is full it sets sail and is valued. The player who succeeds in loading the most barrels is the winner! The idea of this game is to get the most points through loading your barrels onto ships. This is a very tactical game as you move your workers to the most lucrative warehouses to gain barrels and/or coins (with which you can hire extra workers for one round). If you land where another worker has already been placed you can move him and take his place, this could be bad news for this worker if he gets put on a warehouse with broken barrels. It is very enjoyable and has a nice feel of being a family game. All ages (recommended from 8+) would enjoy it. I like that each component is well represented, the figures are a nice size, easy to move. The warehouses are thick cards which can be changed each time you play and the boats (again thick card) pull up in the harbour next to the board. Even the barrels are little hexagonal wooden shapes. Once again this is a Queen Games production, the pieces are of excellent quality as is all the artwork. The board is maybe a tad larger than it needed to be. The board is 2-sided which side you play depends on the number of players, this seems to be a new trend in games and is very welcome. Each player controls 2 dock workers and during the game there is an option to hire a 3rd called "Lazy Jack". There is a playing order track and each players docker has a corresponding marker to place there (at random) this then determines the play order. Each player has a hand of cards for each docker with values 1-5, they select one card for each and starting with the first docker on the track they are moved the number of spaces indicated on the card. If another player is on that space they are kicked to the space opposite, if that is filled the players piece is moved back to the next empty square. In the middle is a series of rooms with barrels in, some are broken, some have coins etc. If after the movement they contain barrels the player places that many barrels on one of the ships in port, if they contain broken barrels they have to be removed from a ship. Play continues in this manner until all players have emptied there warehouses, if a ship is filled it sails and is scored, at the end of the round the ship is port 1 sails regardless of whether it is empty or part filled and scored. The ships are replaced and the turn track is shifted down one so the last player piece now starts the next round. Halfway through the game this turn order is randomised again and play then continues until there is only 3 ships during part of the round. I really enjoyed this, yes there is a bit or randomness here but there is also some chance of strategy. On the whole a really enjoyable game that I would certainly play again.